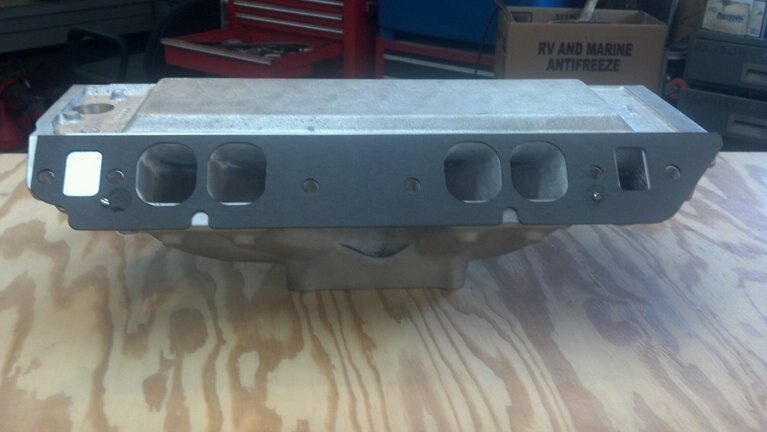 "I was wondering what one of these new Super Sucker carb spacers would bring compared to a regular 4 hole spacer." 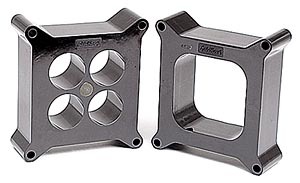 Ill say right off that I have not used one of those super sucker spacers, personally, but I have seen several used, on cars and I have used very similar carb spacers many times,and worked on cars with them installed. 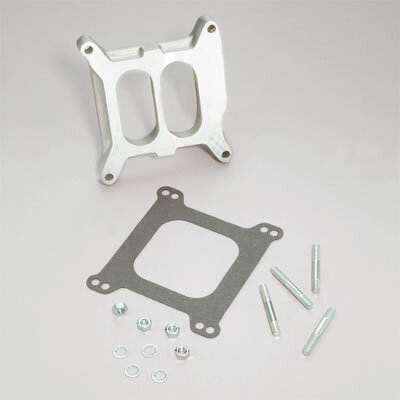 [b] carburetor spacers are used to either increase plenum volume or increase the distance from the carburetor venturies to the intake runner entrance's or too reduce the angle the airflow must make as it enters the intake runners from the plenum,or a combination of those factors. 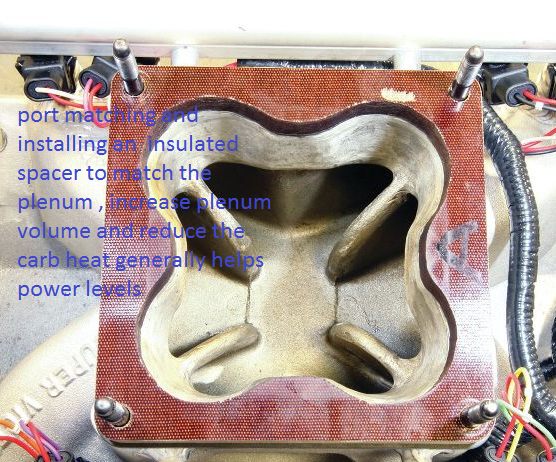 that maintains isolated plenum feed from each side of the carb. 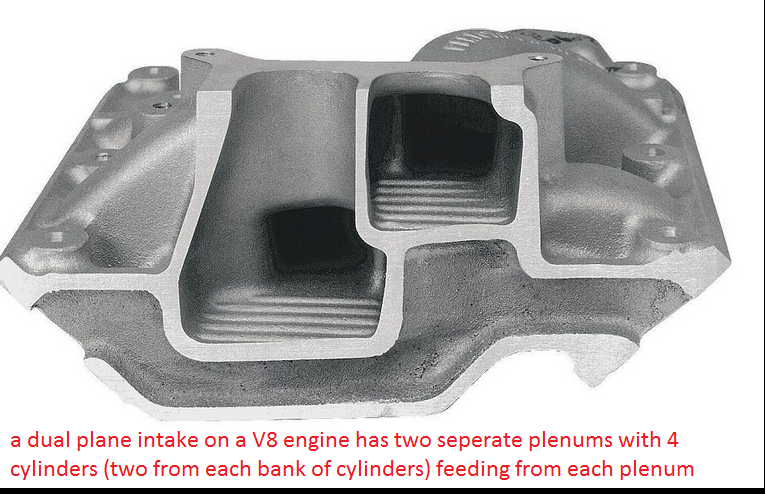 they seem to have an anti reversion design to limit reverse flow from the plenum which can be useful. 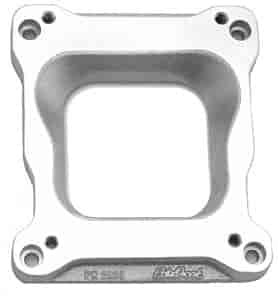 I prefer the standard spacer designs,but in some applications you might see gains from that anti reversion lower spacer design. Ill also add that if you have the room under the hood, adding a second phenolic 4-hole 1/2" tall carb insulator or swapping to a 1" or even a 2"phenolic 4-hole spacer may further improve the carb cooling and may help the fuel atomization slightly, but the correct spacer must be matched to the style of intake manifold. 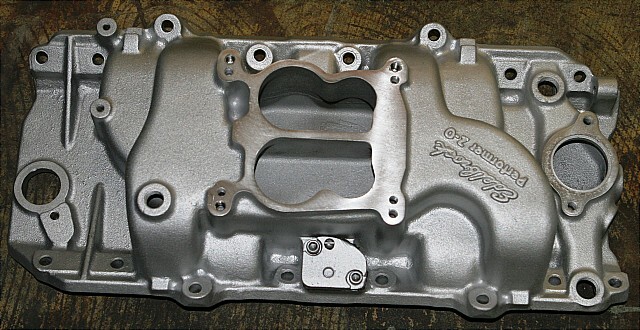 having the plenum divider fully in place below the carb base, tends to help lower rpm torque and crisp responsiveness to minor throttle position changes, removing the divider effectively increases the plenum volume the runners draw from and that tends to slow low rpm response to throttle changes but it tends of increase the flow rates slightly at high rpms so power in the upper rpm band tends to go up as the plenum volume is less of a restriction. 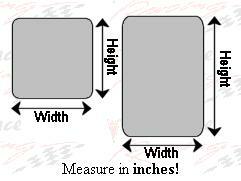 notching the divider tends to split the difference to some extent. 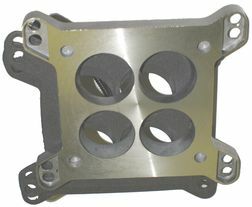 theres two basic carb spacer designs, they are commonly 1" or 2" tall, the one hole open spacer and the 4 hole designs, the 4 hole design in effect maintains the divided plenum, but adds plenum volume and reduces the restriction the limited space between the carbs venturies and individual intake runner entrances can have in some intake designs. 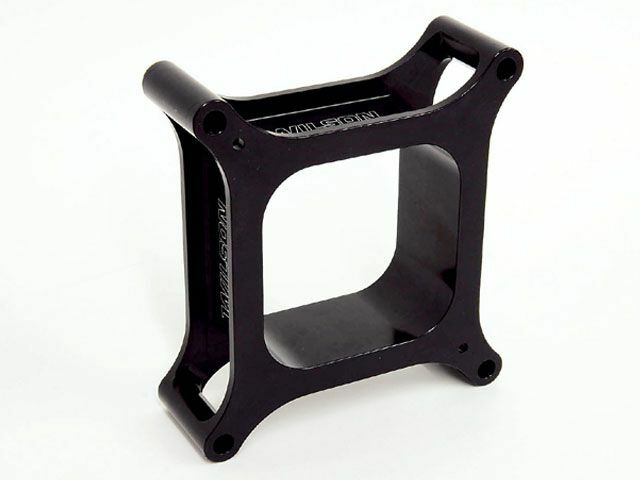 the open common plenum spacers are designed for use with single plane intakes where adding plenum volume helps upper rpm flow..
as a general guide,and assuming your static compression ratio matches the cam duration you select, if your running less than about a 235 dur @ .050 lift cam, with a 2.57:1-3.36:1rear gear ratio, a dual plane intake should prove beneficial, have more than about 245 degrees dur. 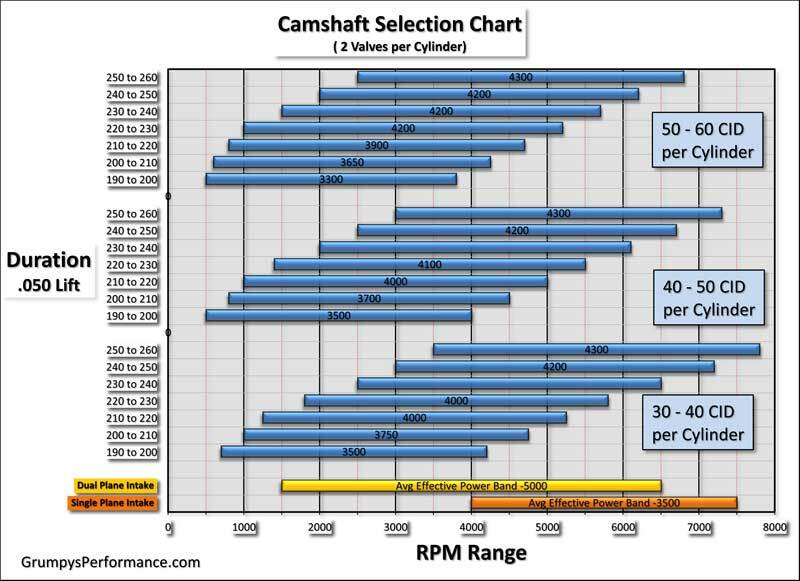 @ .050 lift, and a 3.45:1-plus rear gear and a single plane intake will generally prove useful. 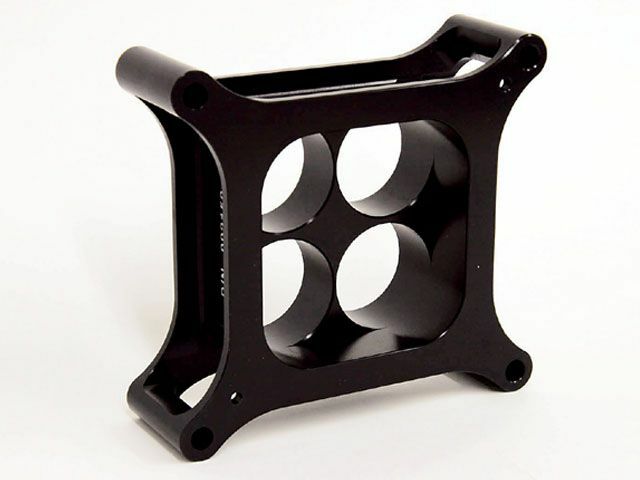 its common for the four hole design spacers to work better on the dual plane intakes and the open plenums to work better on the single plane intakes but your combo will require testing as there are exceptions. 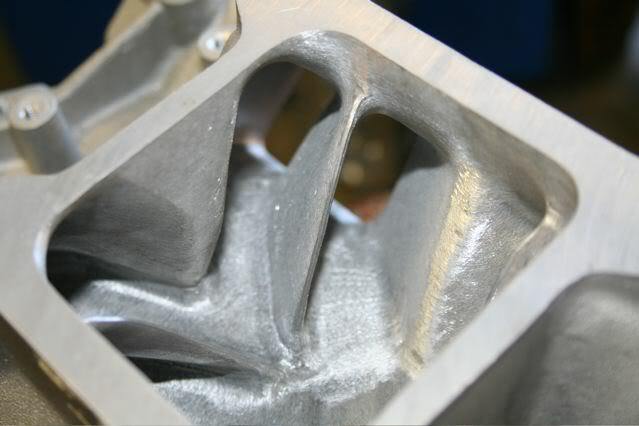 in an ideal world you generally start with a plenum volume of about 1/2 the engines displacement and work up to about 3/4 of the engines displacement, as in most case thats the range that will provide the best hp, but cam duration, lsa,intake runner length and cross sectional area ,cam lift, exhaust scavenging, tuning the exhaust, will all effect your results,and the intake design effects the requirements, a tunnel ram will be a different deal than a low rise single plain design, if you really want to research it, one fairly safe rule of thumb is that if your cam has less than about 235-240 duration @.050 lift, a DUAL plane like a edelbrock air gap with a full intact divider under the carb, will provide the best results. 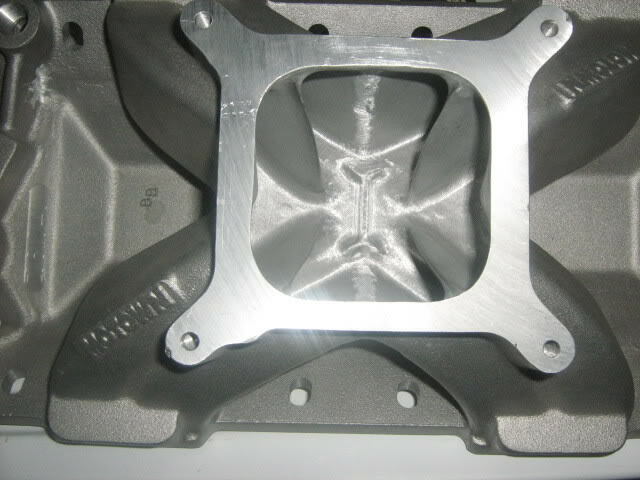 spacers are a tuning tool used to extend the distance from the carburetor venturies to the plenum floor and change the entrance angle of the air flow into the intake runners OR TOO, increase plenum volume or BOTH. 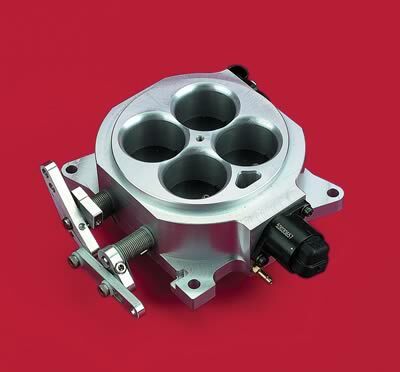 properly used as a tuning tool you can generally raise the engines peak effective volumetric efficiency several hundred rpm in some cases with the correct carburetor spacer design,but adding plenum volume frequently reduces responsiveness and costs a small amount of low rpm torque in exchange fore increased upper rpm peak hp. 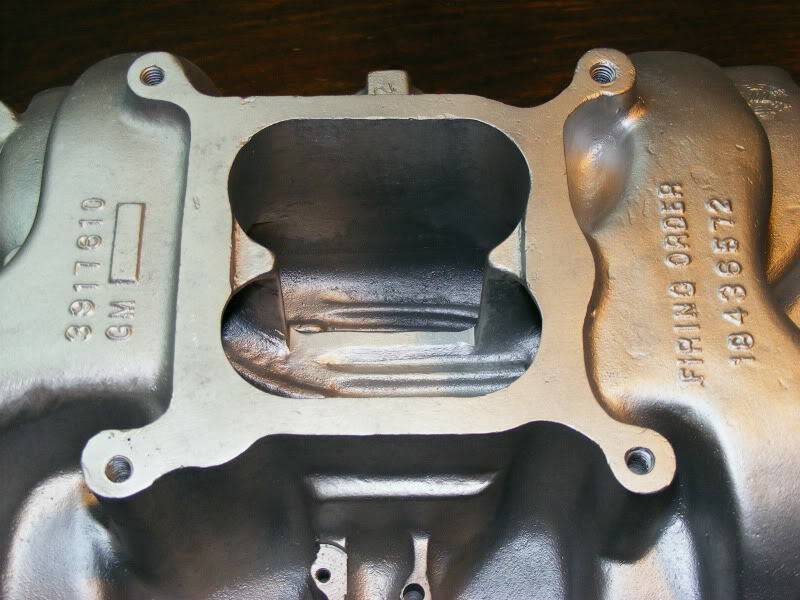 BTW its always rather amazed me that so few guys are willing to experiment or do minor plenum and runner clean-up on an intake manifold, and trust me when I say that most out of the box intakes can use some careful inspection and casting flaw clean-up and in some cases port matching. this MODIFICATION, BELOW effectively reduces the dual plane to a badly designed single plane intake, it might still make decent power, but its not generally as effective as a true single plane design in the upper rpm range and it tends to have sacrificed some low rpm power also, the partial divider removal above can at times help smooth out, and slightly increase, the cars low speed power curve, but generally theres a slight loss in low rpm crisp response , so just a bit of open discussion here, I know many of you have done that cutting down the dual plenum divider mod and I own a milling machine and have done it for several friends in the past and ,yes you generally do pick up some peak horsepower as a result of the increase in plenum flow rates in the upper rpm band. 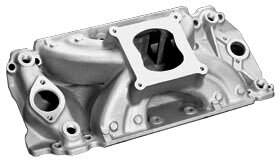 Ive always been amazed at the number of guys who take an intake manifold out of the box and proceed to bolt it on an engine with out doing the port matching and plenum smoothing and runner entrances mods required to maximize flow rates and even out fuel/air distribution issues and reduce air flow turbulence issues, its common to be able to gain 15-20 horse power if you take the time to do whats required. 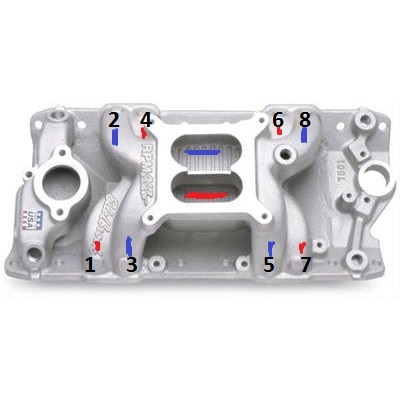 You've likely read or heard about an assortment of consequences when a carburetor is raised (or lowered) relative to an intake manifold's plenum floor. 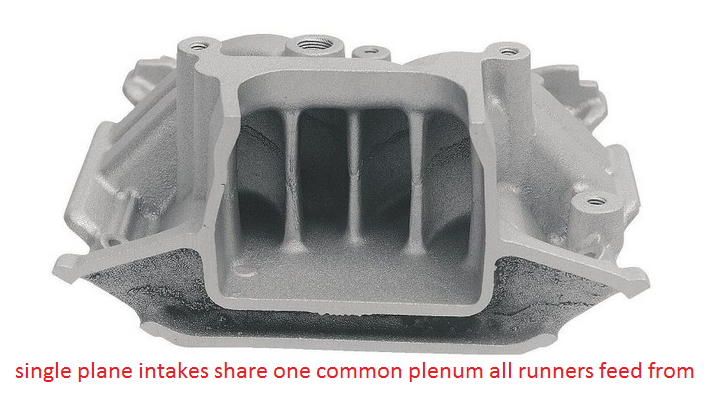 More plenum volume helps high rpm, for example. 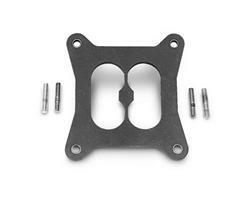 Or maybe, smaller carburetors like more spacer. This isn't to say these analogies are incorrect, but maybe the reasons are a bit obscure. For example, let's look at it this way. 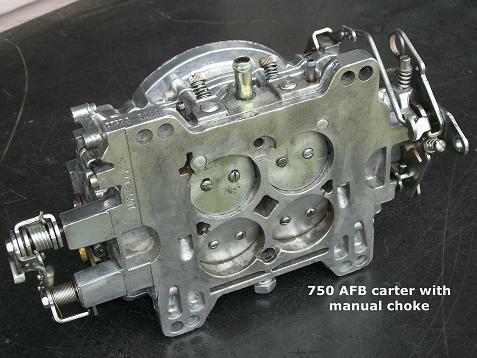 A carburetor is a pressure differential device. It delivers fuel into a region that's designed to be at less than atmospheric pressure. 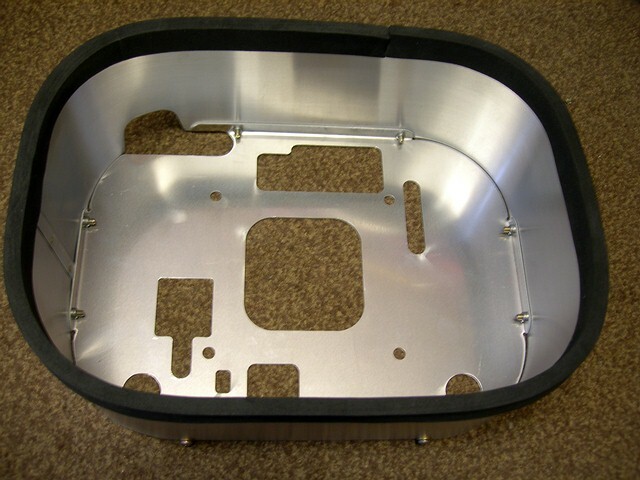 It's a fuel metering "signal" that allows atmospheric pressure to force fuel into the incoming airstream, acting through the carburetor's bowl vents. 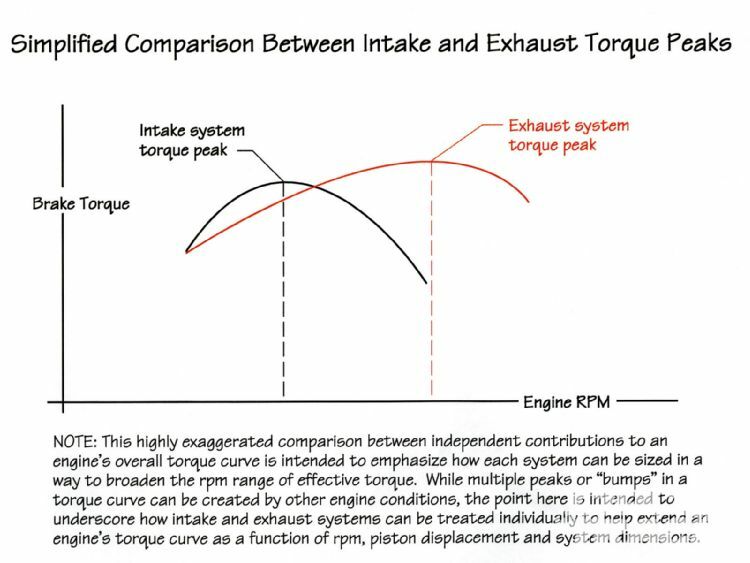 By elevating a carburetor, all else being equal, it becomes more remote to runner entries and thus can experience a weaker metering signal. 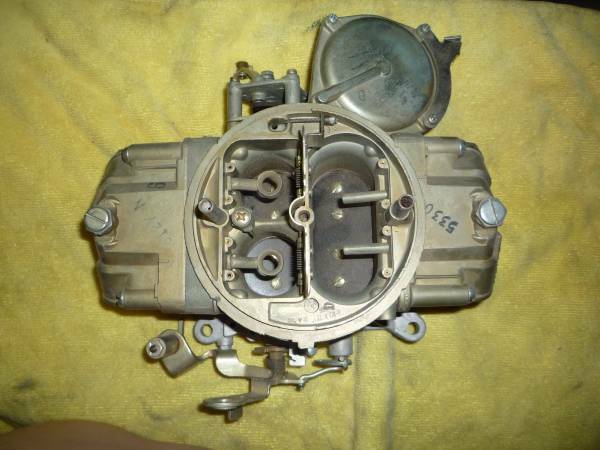 The carburetor tends to act "leaner" in the presence of a decreased signal. 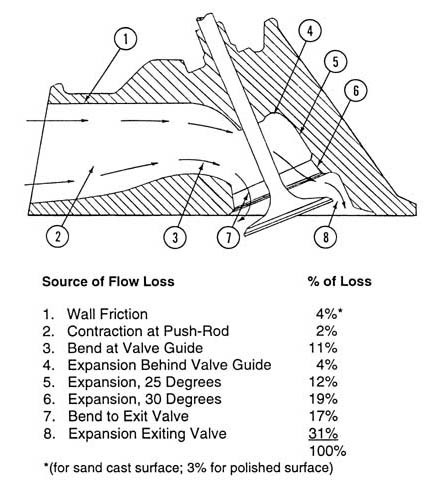 Aggregate airflow tends to be the same but there's less fuel flow, so fuel enrichment is decreased. However, as Smokey often said, "there's one more little item." 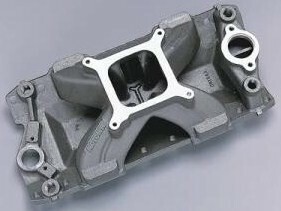 Once discharged from the carburetor, air/fuel charges are required to make a relatively abrupt turn into the manifold's runners. Air, being compressible can navigate this sudden change more easily than fuel. 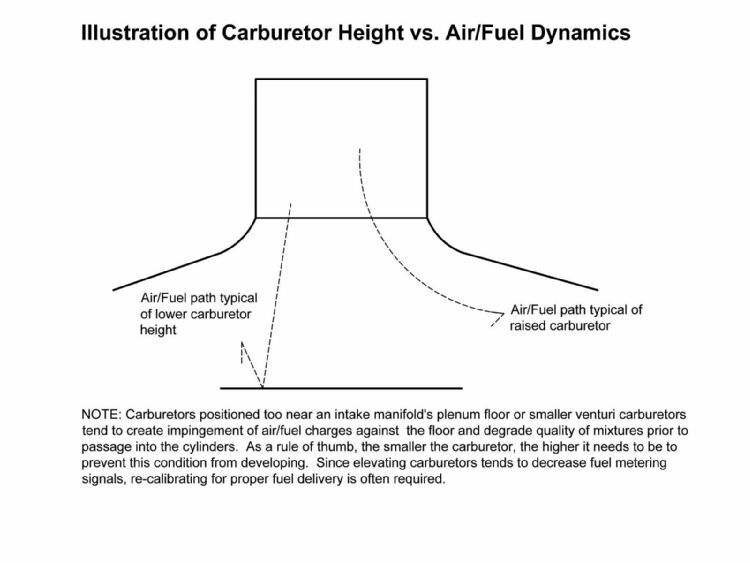 Increasing carburetor height allows air/fuel charges more time to slow down and make the turn more effectively, often reducing the possibility of air and fuel separation. 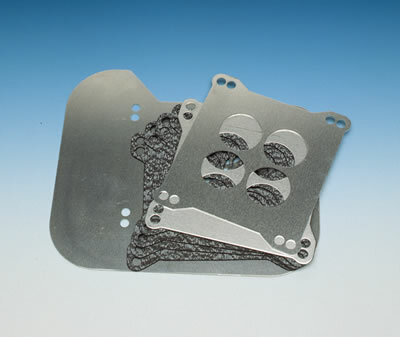 As carburetor size is decreased and no spacer is used, the problem becomes more critical. 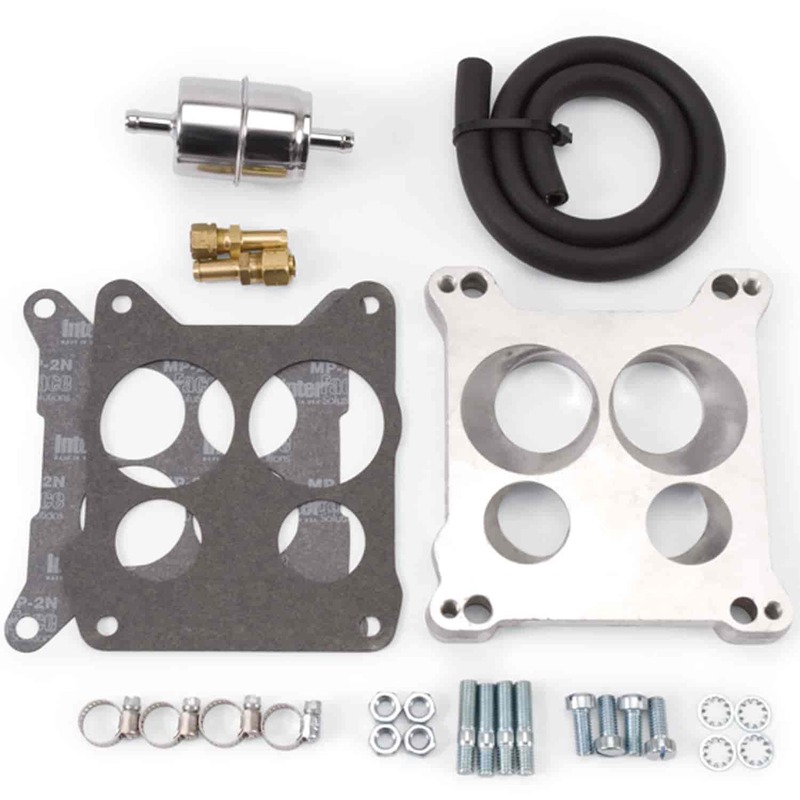 In fact, carburetors placed too near a plenum floor can be akin to sticking a hose in a bucket with fuel impingement materially upsetting proper air/fuel mixtures. 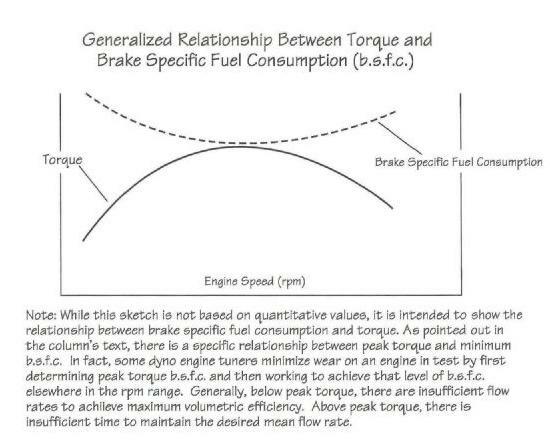 One key here is to map brake specific fuel consumption (BSFC) data as carburetor height is changed, assuming carburetor sizing remains the same. 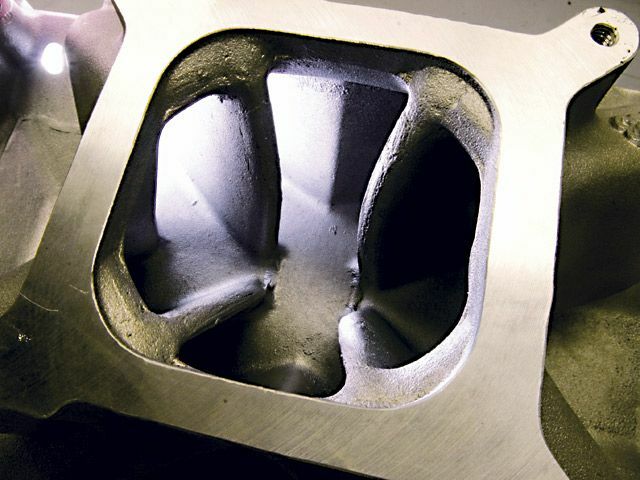 If a disproportionate amount of fuel is required for best power and BSFC data are trending higher and higher, chances are good mixture quality is being upset and raising the carburetor is a potential solution. 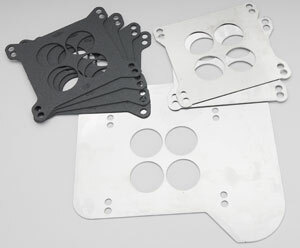 On the other hand, if you discover that a four-hole spacer is beneficial, possible reasons include the fact the fuel metering signals were insufficient (for the calibration or jetting being used) and stronger signals provided by the spacer helped deliver additional fuel. 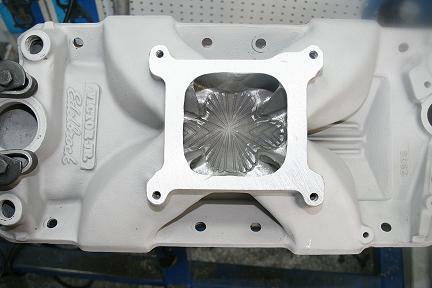 But in virtually any case, power changes from raising or lowering a carburetor affect more areas than plenum volume. 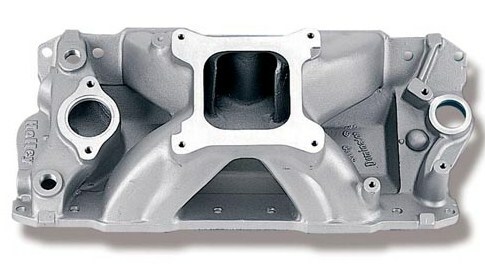 BTW, while were discussing intake manifold modifications lets spend 2 seconds on what may be the most over-looked and one potentially important area, the runner entrances. 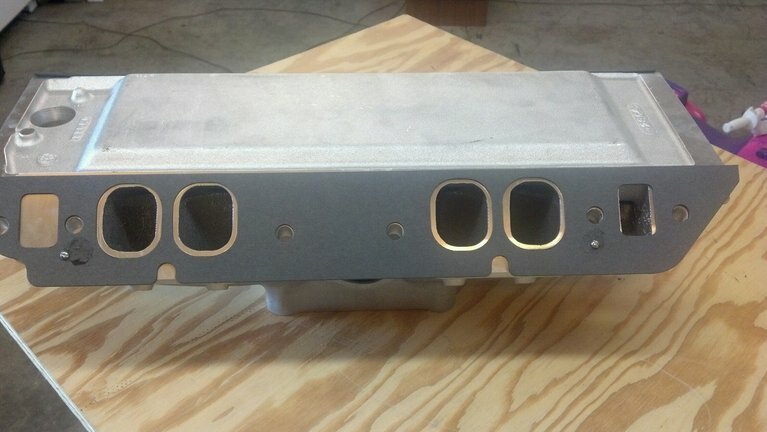 heres a couple professionally re-worked single plane intake plenums, notice they don,t look a lot like the out of the box plenumsthe port entrance is raised and smoother the dividers are contoured, etc. 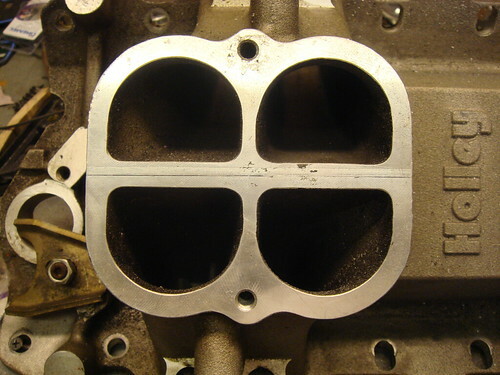 if the port exit on the intake is a bit smaller than the port entrance on the heads its not nearly as beneficial to port match the intake/cylinder head interface as it will be if the mis-match is a larger intake exit to head port, if the ports are off set the sides that mis-align follow the same basic concept, a slight lip or step should be removed and blended smoothly if it forms a restriction to flow in the direction the ports designed to flow, but your potential gains from port work are small as the height is less than about 1/16"
BTW everyone eventually screws up some part made of aluminum, and TIG welding and re machining will fix almost any aluminum part, especially cylinder heads where heat and pressure make using epoxy less than ideal in many cases, but for minor intake manifold runner, and plenum repairs you usually have a second option, with welding you take a chance of warping the intake casting, but with a paste made from two part epoxy, 75% epoxy and 25% aluminum powder mix, the mix makes a very durable port wall filler paste,vaguely resembling a silver bondo paste but far more durable..
many guys spend 90% of there porting time on intakes matching the ports to the heads and opening the runners up, but a surprising amount of the potential flow improvement on many intakes involves the port work on the runner entrances in the plenum area. 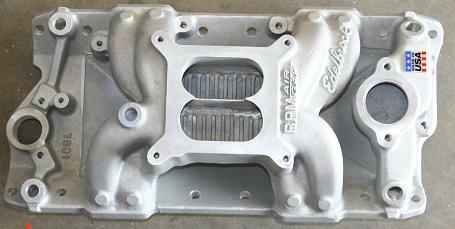 RPM TQ1 TQ2 HP1 HP2 TQ DIFF. HP DIFF. 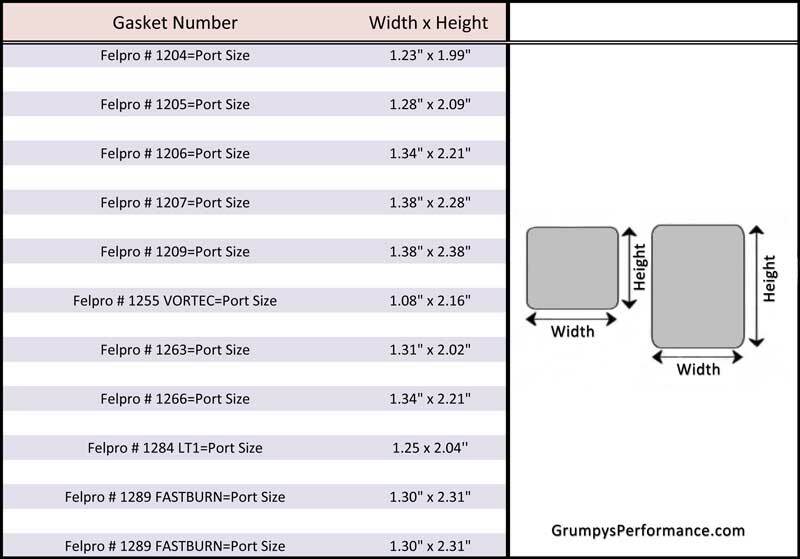 felpro # 1204=Port Size: 1.23" x 1.99"
felpro # 1205=Port Size: 1.28" x 2.09"
felpro # 1206=Port Size: 1.34" x 2.21"
felpro # 1207=Port Size: 1.38" x 2.28"
felpro # 1209=Port Size: 1.38" x 2.38"
felpro # 1255 VORTEC=Port Size: 1.08" x 2.16"
felpro # 1263=Port Size: 1.31" x 2.02"
felpro # 1266=Port Size: 1.34" x 2.21"
felpro # 1289 FASTBURN=Port Size: 1.30" x 2.31"
If you put an Edelbrock square bore carb on a spreadbore intake DO NOT use an open single hole adapter! 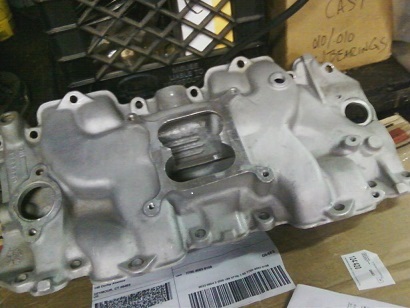 It will cause driveability issues often times and hurt idle quality, off idle response, torque and mpg. 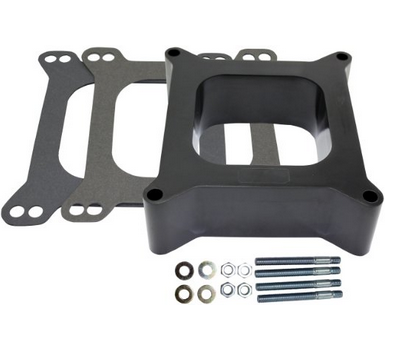 Only the 4 hole adapter/spacers design specifically for this swap should be used on a street driven car. OK guys, here is the scoop. I've been working with Chris Cobb at DynoTune Engineering, www.dynotuneengineering.com in Paris Tennessee. First, one nice guy! Anyone who needs dyno service, fabrication, engine assembly, needs to check him out!! 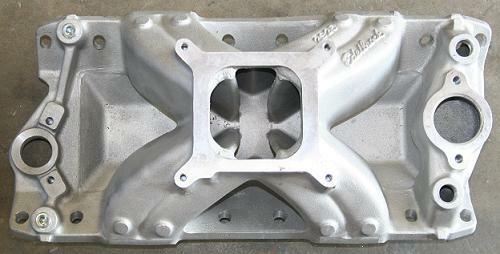 To make this a fair test, the manifolds and engine were tuned to a 13.2 AFR. 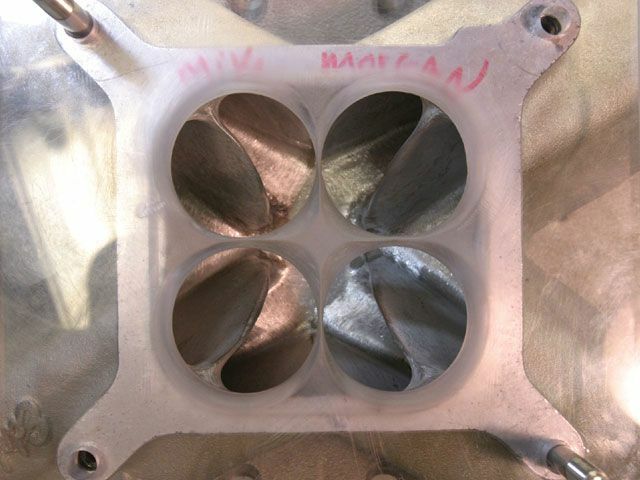 The engine that was used as a test mule is a UMP Dirt Modified. Here is the breakdown. 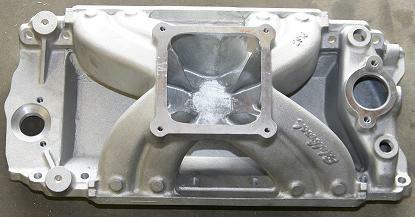 The dyno session was to compare a box stock 2925 vs a Modified Plenum 2925. 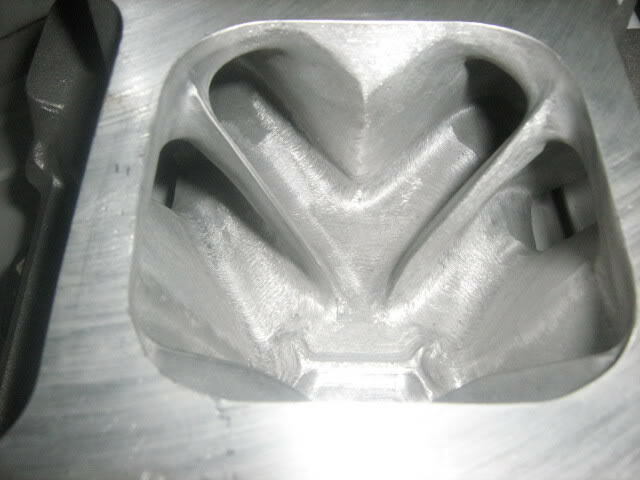 Other manifolds were tested, we will get to them. Note: Chris said it accelerated .10 faster than the stock manifold! I'll have more info as we go. He is testing spacers tonight.. 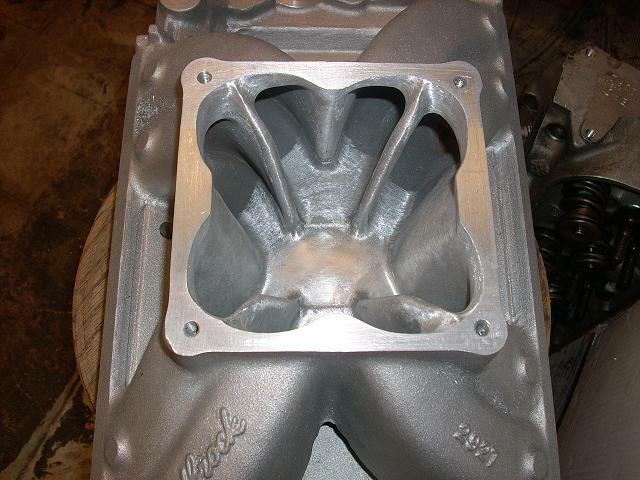 Here are the comparisons for the Edelbrock Super Victor 2925 vs the Motown 061040. 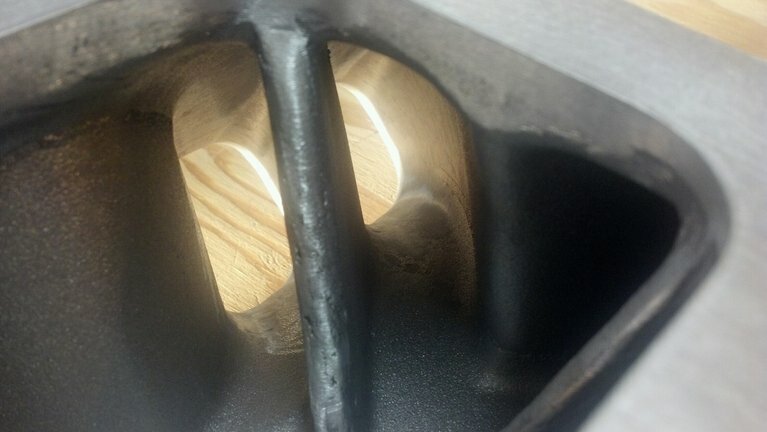 Both intakes were right out of box with no work done. The Motown was slightly better in each of these test, but it showed the biggest improvement in the test with no carb spacers. Another area that it showed improvement was the elasped time of the pull and the increase in average acceleration rate during the pull. These test were performed back to back within a couple of hours of each other on the same day. 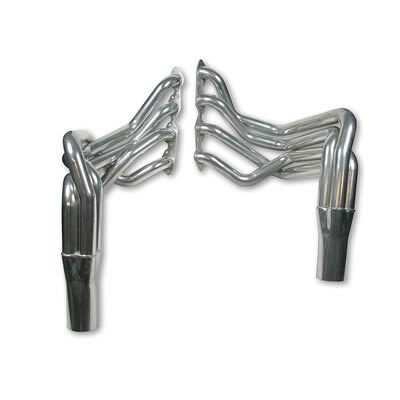 We have other manifolds that were tested in this test and will share those results later. 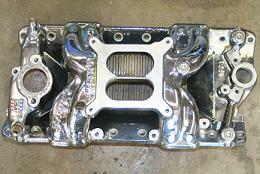 I'm running a 1965 Chevrolet 283, recently rebuilt, with an RV cam in (this is in my Chevy C-10). 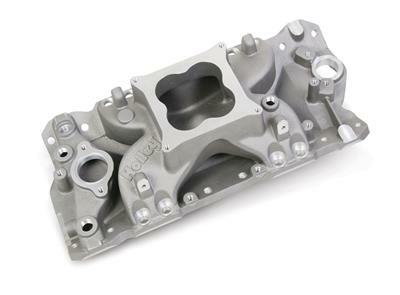 My intake is an Edelbrock, but I'm not sure which one, but it's aluminum and has the split plenum divider for a 4-bbl carb. 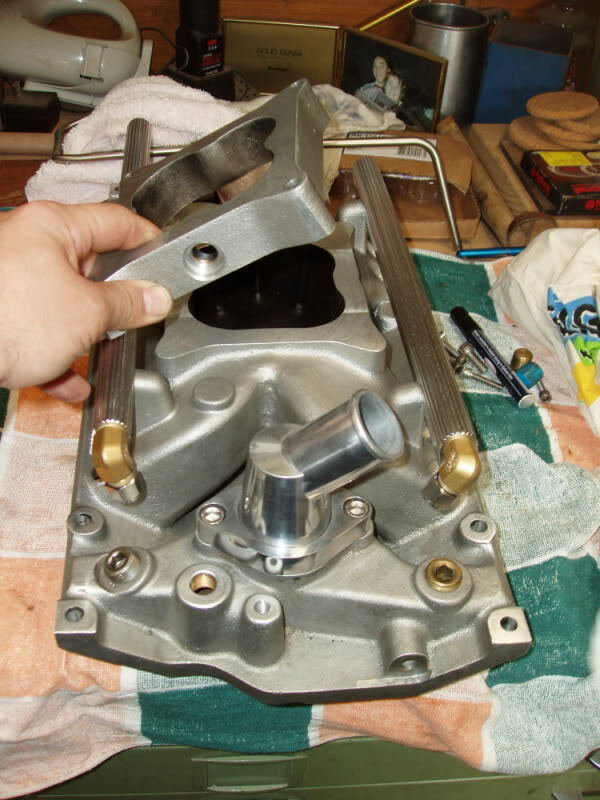 My carb was chosen for fuel economy and mild performance (mostly economy), and is a fully rebuilt Holley 4360 Economaster, which is a spreadbore type carb. My current in-town mileage averages 17 mpg, so I'm happy with that, but not with the problem I'm having now that summer is here. Here in NE Oklahoma, we have high humidity most of the year, and the temperature in summer is often at or above 100-degrees. This puts the heat index at or above 110-degrees many days. My truck has been running wonderfully since I got her going this past Spring, but, when the summer heat hit, I started having problems with vaporlocking. I replaced the fuel pump (mechanical), and re-routed the fuel line, but to no avail. 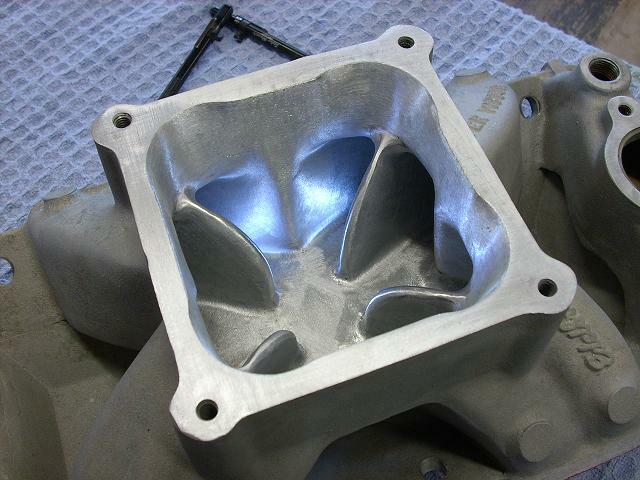 I've traced it down to the high probability that the aluminum manifold is transferring the engine heat so well to the carb that the fuel is vaprozing in the bowl. 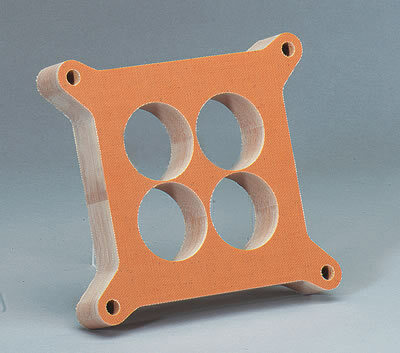 I understand that a phenolic spacer is the typical choice to solve this problem. Typical aftermarket spacers of this type fit the Holley spreadbore, but the hole sizes aren't correct for my carb. 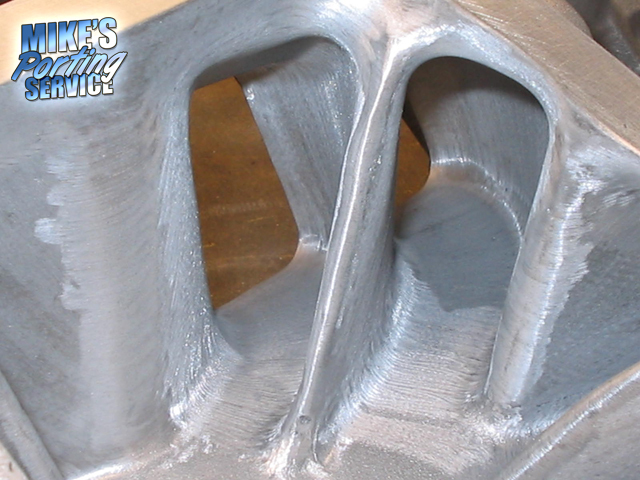 The Primaries on my 4360 are 1-3/8" in diameter, and the Secondaries are 1-7/16" in diameter. 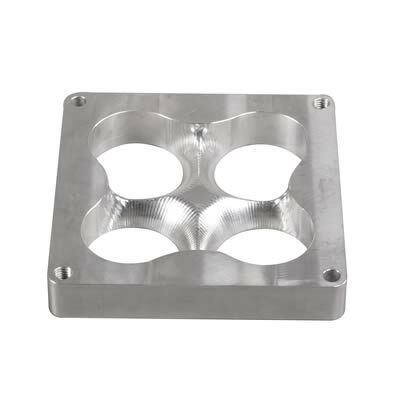 The holes in the phenolic spacers are made for the typical Holley 4-bbl carb, and, thus, are not direct matches for the openings in my carburetor. 1. 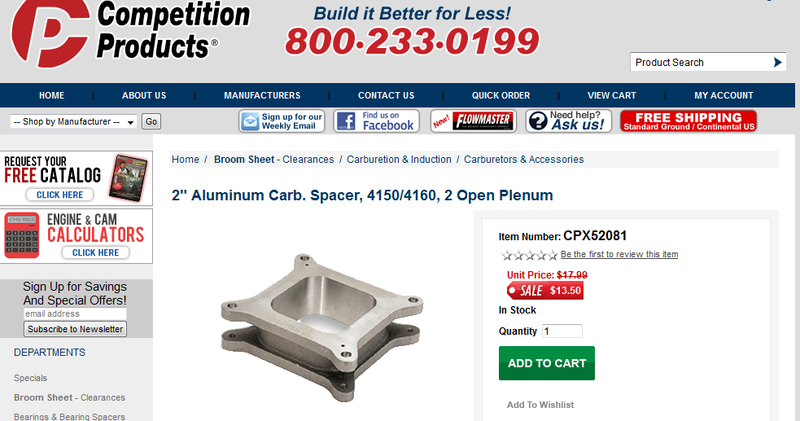 Should I be looking for the open style or hole type phenolic spacer? 2. How thick should I get? 3. 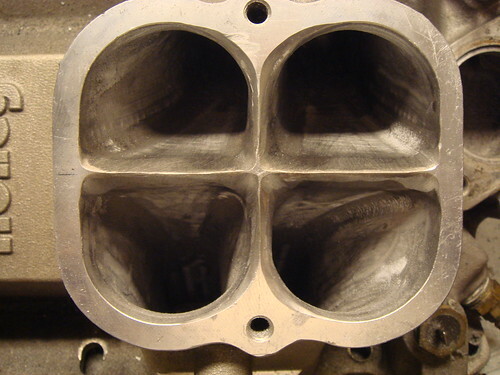 Will the difference in hole diameters affect the proper performance of my carburetor and engine? 4. 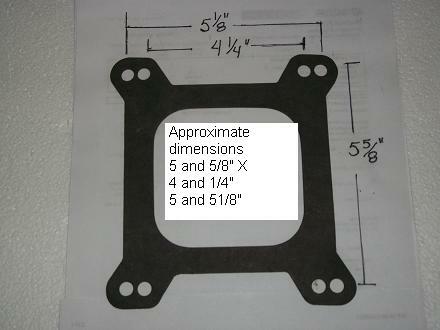 Will adding a spacer affect the performance of my 4360/283 combination, and, if so, in what way? 5. 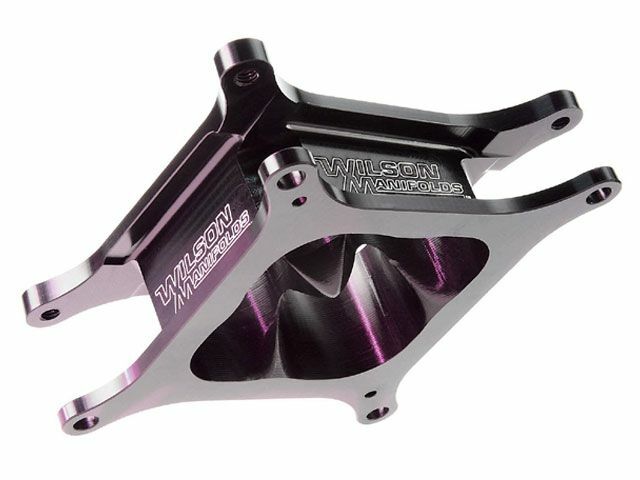 Will adding the spacer require a change in my jets? 1. 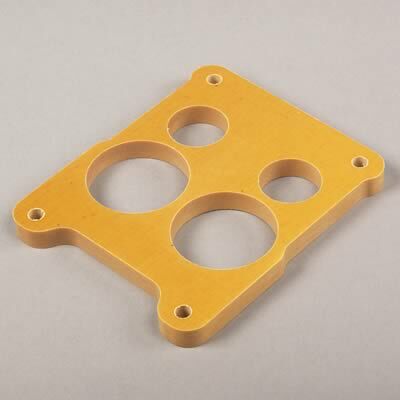 Should I be looking for the open style or 4 hole type phenolic spacer? 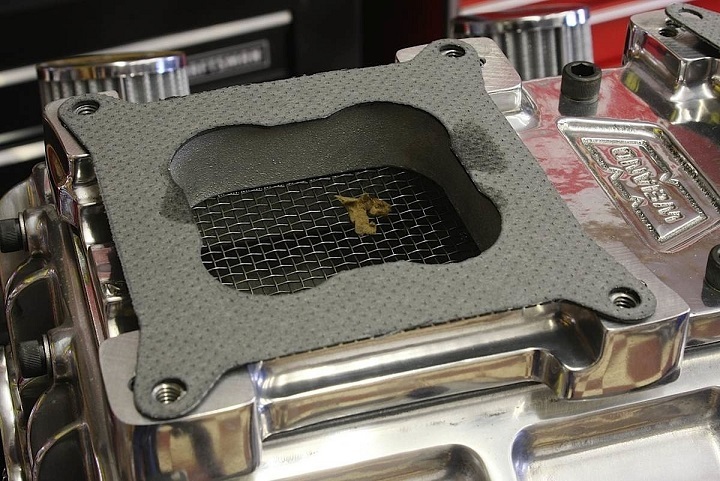 With regard to the jetting issue - would reducing the thickness to, say, 1/2", still function to effectively insulate the carb from the engine heat, yet reduce the possibility of having to change the jets? its unlikely to "need" a jet change with either spacer thickness,because the change will be minimal, I doubt youll notice any significant change other than a reduced tendency to get into vapor lock, but in most cases it will run a bit better if you take the effort to read the plugs and increase or decrease the jetting to match what the plugs indicate is required, so in most cases your going to "WANT TO CHANGE AFTER DIAGNOSING THE TRUE FUEL/AIR RATIO" but only testing after the swap will truly tell. 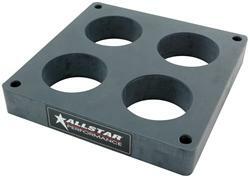 Id also point out many plastic carb spacers used alone are next to worthless at isolating the carb base from manifold heat. One last thing - I've been looking around at various designs for these spacer/insulators. In my case, what do you think about one like this one? Todd_W_White wrote: Thanks for all your help! 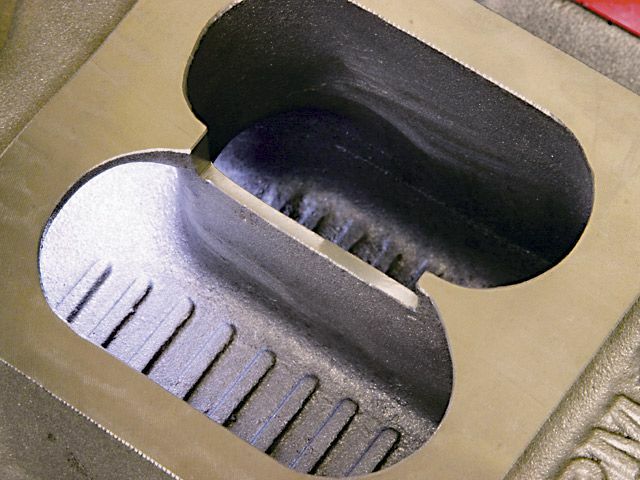 I don,t think anyone will seriously debate the point that removing the divider on a dual plane intake plenum and there by increasing the available plenum volume and accessible flow rates has the potential to significantly increase the power in any application where the divider is effectively restricting flow such as the 496 bbc mentioned above, but a properly selected and matched single plane intake used in the similar combo has the potential, to improve even on those numbers. 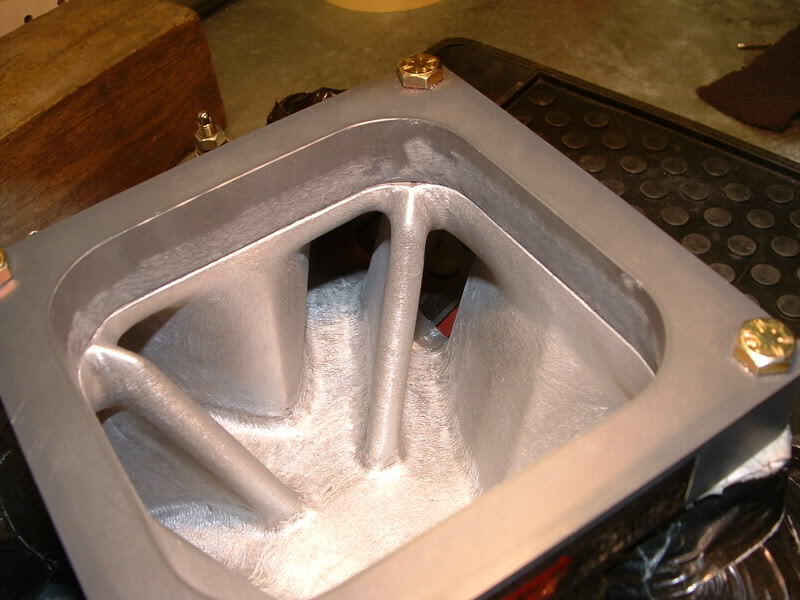 his first actual engine mod was cutting the intake divider ,out on the stock intake, the second mod was to swap to a wieand or edelbrock single plane intake , both changes resulted in a noticeable boost in seat of the pants power you could feel.